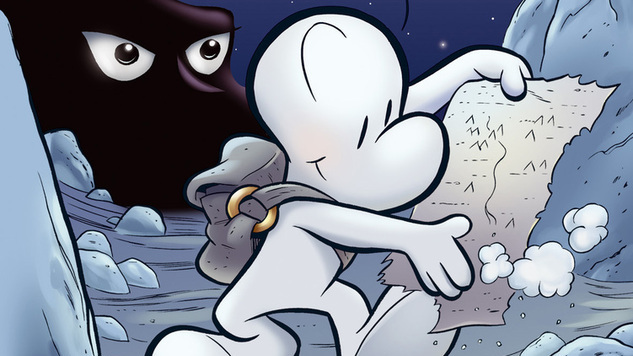 Determining the criteria for a list of the best children’s comics of all time is a bit more challenging than picking the best horror, sci-fi or webcomics. We are (by the legal definition, if not emotionally) adults, and many of the works on this list hit shelves well after we aged out of the target audience range. That leaves us with the task of dually evaluating the comics below: are they good, first and foremost, and are they good for or valuable to children? Heck, even determining our criteria for “children” was tough, and we ultimately settled on the full gamut from beginning readers through to pre-teens, although, many of us begin reading “adult” comics in our upper teen years. But every title in this alphabetically ordered catalog has the potential to mean something special, to offer something valuable and important, whether that’s revelatory depth or escapist fun, to a young reader. From wordless animal adventures to complicated teen identity sagas, these books form an all-ages canon worthy of the budding comic children in your life. Ever since cartoonist Roger Langridge left his mark on The Muppets for Marvel, he’s displayed a deft hand at creating kid-friendly comics with enough sass to entertain adults, too. Abigail and the Snowman shows what happens when the new girl in town invites a mythological monster—a friendly, furry mythological monster—into her home. This miniseries is a delightful, all-ages romp, and entertains with a variety of sight gags built around Claude the Yeti’s invisibility—teachers oggle a human pyramid constructed around the transparent beast in one of the book’s best pages. Though fans may be more familiar with James Tynion IV’s name from his work on Batman-centric titles like Detective Comics, he’s been writing YA comics for most of his career. The Backstagers is, in many ways, the best of what all-ages comics have to offer: a fun jaunt with serious notes about discovering where you fit at the most awkward periods in your life. The cast is the stage crew of an all-boys school who have adventures far beyond the backstage machinations of a production. Supernatural secrets lay hidden in the bowels of prop rooms and costume wardrobes, laid out by Tynion IV and co-creator Rian Sygh, who sports a poppy, fun art style that perfectly suits the motley crew.